Better get those jazz hands ready — over the weekend of 20- 21 June the casts of around 3o theatrical productions will be taking to stages in Leicester Square and Trafalgar Square to perform their best bits for the public — and all for free. 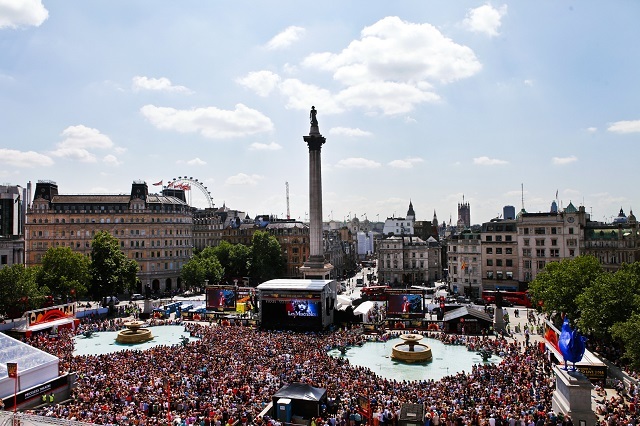 West End Live is now in its eleventh year, with top shows going al fresco to entertain the huge crowds that gather for this popular event (they're expecting half a million people this year so maybe jazz elbows will be useful too). The shows contributing performances include returning favourites like Billy Elliot, Charlie And The Chocolate Factory, Mamma Mia! and Matilda. And there's new participants like Gypsy, Dusty and Sunny Afternoon. There'll also be previews of upcoming shows Elf and Three Little Pigs. The Sunday will be less mainstream with West End Cabaret, for which the organisers have asked the public to tweet their favourite show tunes to be performed (suggestions before 10 June). In Leicester Square, the 1920s style Spiegeltent will be used as a Kids’ Zone with family friendly sessions including a Dinosaur Zoo, Aliens Love Underpants and Horrible Histories. West End Live takes place on 20-21 June, all events are free but you may want to plan for the crowds.